There’s a conviction shared by some top Montreal-based chefs to keep food local, explore heritage Canadian dishes and celebrate the fruits of the region’s lands and seas, harkening back to the days of Quebec’s fur trappers and tree tappers. Au Pied de Cochon (in English, pig’s foot or pig’s trotters) and Manitoba are two standout restaurants in Quebec (whose motto Je me souviens, “I remember” in English, seems apt for chefs with this commitment), that have become fine dining destinations for meat eating omnivores with a willingness to experience “fine dining” that encompasses delectable wild foods. 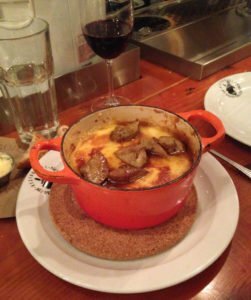 Au Pied de Cochon (or PDC as it’s referred to in Montreal) and Martin Picard, the founding chef and iconoclastic personality behind it, deserve much credit for Montreal’s culinary revolution that looks to local food for inspiration. 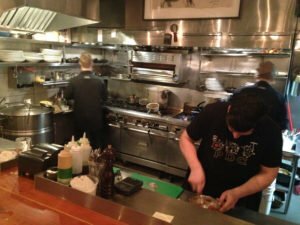 With steady praise for his cooking (viewed by some as defiantly decadent), Picard has become well known as a chef, well-beyond Quebec’s borders. The chef and television personality Anthony Bourdain has called PDC one of his favorite restaurants on the planet. In Canada, Picard is also famous for his Food Network show, Wild Chef, which aired a few years back, that followed him on fishing and hunting trips as he prepared delectable-looking wild game like muskrat, moose, eels and geese in alfresco backcountry kitchens. Besides a long-standing commitment to using locally grown and raised ingredients (including some, like the restaurant’s ham and maple syrup, that are produced on Picard’s own farm) and practicing a zero-waste, nose-to-tail philosophy, what stands out most about chef Picard’s cooking is a disregard for trend, and he seems not to let anything stand in his way of giving people what he believes to be delicious food. The result is rich, satisfying and unique meals made with a Dionysian embrace of fats and meats. Anthony Bourdain describes the culinary approach in the introduction to the restaurant’s 2008 cookbook, as “an ode to all things porky, ducky, fatty and wonderful.” Yet even after reading descriptions of Picard’s food, I was woefully unprepared for the intensity of the feast that awaited. 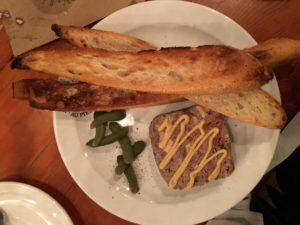 On a Friday evening when I visited, the small and warmly lit bistro space was packed to the gills and filled with the tantalizing scents from the open kitchen and the happy sounds of contented diners. 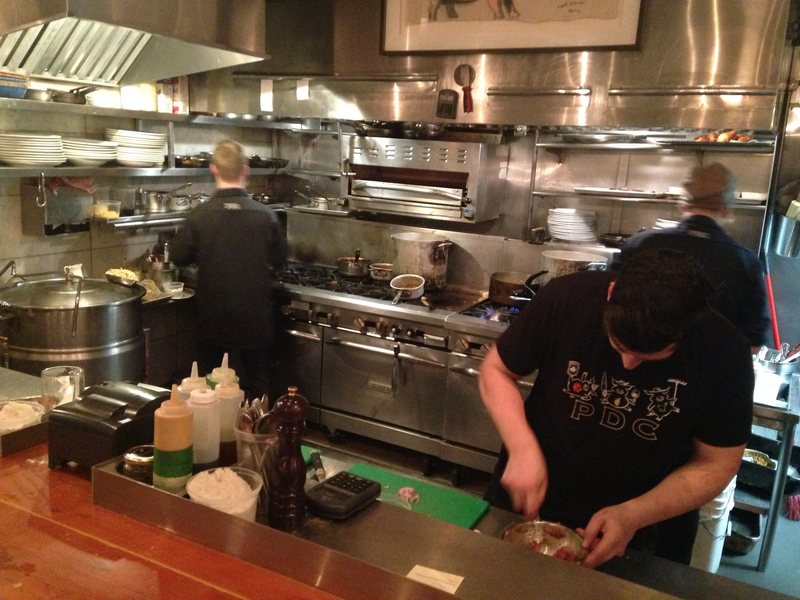 Opting for a counter spot earned a slightly faster seating and an excellent perch from which to watch the kitchen staff at work. PDC’s deceptively simple menu forgoes elaborate descriptions for one-word dish names and abbreviations. Thankfully for us neophyte patrons, the restaurant’s wait staff are ready to impressively rattle off the long list of ingredients in each dish. As plated entrees flew by inches past my face in the narrow, bustling space, the selection process became more of a ooh, what’s that table having? and what are they making over there? than anything carefully thought through. I decided to start my meal with the exquisitely plated cheval carpaccio. 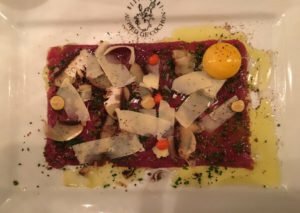 The paper-thin slices of, yes, raw horse meat, were decorated with an abstract, Pollack-like arrangement of thinly shaved mushrooms and parmesan, fresh herbs and small puddles of habañero aioli and dijon. A raw egg yolk and a generous layer of olive oil provided the connective tissue for these disparate elements and lent a thickness to mouthfuls of the leanish and tender meat. I’ve eaten lots of undulate flesh before, but I’d never had horse. I found it, at least in this preparation to be exceedingly clean, slightly sweet, lacking in any gamey, off notes and even somewhat fragrant. With all the garnishes, the dish was complex but still light and altogether wonderful. The French settlers of Quebec are one of but a handful of cultures that don’t have taboos around eating horse and various cuts and preparations of the meat are available on Montreal menus. There may be no better proof of a meat’s quality than carpaccio, which must be meat of the highest and freshest quality. After trying it, I must say that they’re onto something. It certainly convinced me. Next up, I tried the pâte of hare. Drizzled in a creamy dijon aioli and peppered with pistachios, the chunky pâte was amazing. I literally could not help myself from spreading every last bit of its thick, rich lumps on the house-baked crostini spears and greedily chomping down every last morsel. There are few things that I’ve found as satisfying as that pâte, as balanced as it was with the pistachio’s nutty textures, a subtle marsala-like sweetness, hints of garlic, the rabbit’s gamey notes and the fattiness of the foie gras (PDC’s foie gras is sourced from the local farm producer, Palmex Farm, that Picard and staff routinely visit). 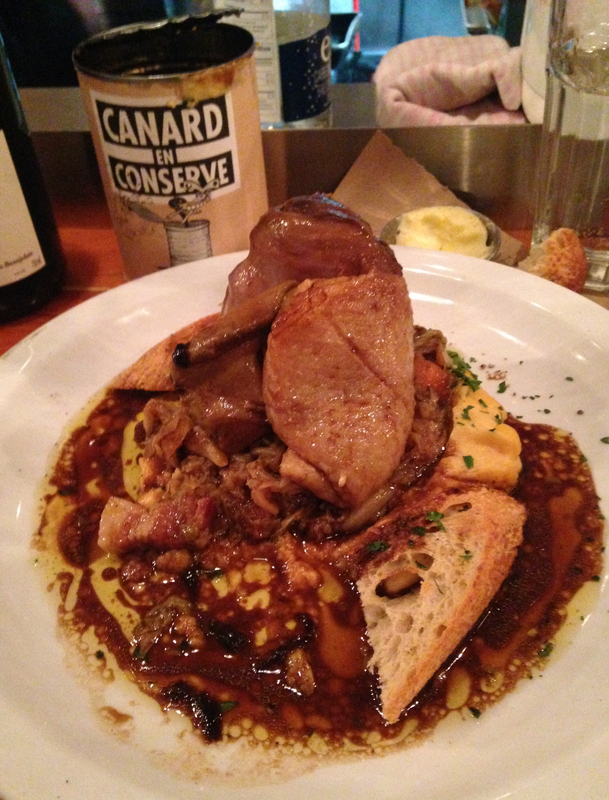 Following that luxurious treat came the most novel dish of the night: the conard en conserve. Also known as the duck in the can, the dish has been a hallmark of PDC for years but is actually a fairly simple preparation of duck breast, cabbage, foie gras, thyme, garlic and balsamic stewed and cooked in the can. When served, the iconic can with its cartoon illustrations, is reheated, opened in front of you by your server, and immediately dumped unceremoniously onto a pile of crostini. The sloppy look of the dish was no disguise for a subtle elegance. Unpretentiously hearty, indulgent and filling, it had big flavors (and the kind of fat content that would make a lumberjack smile and a doctor frown). The duck meat was succulent, and the sauce was worthy of some serious lip smacking. 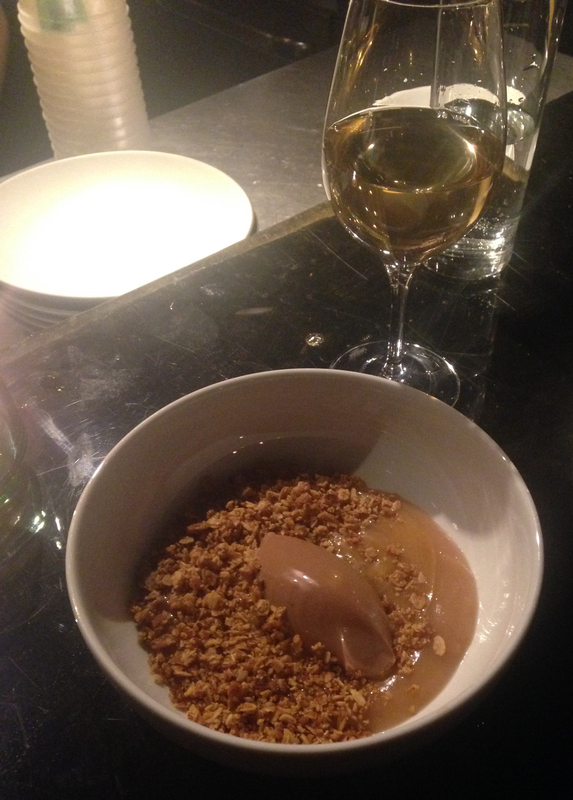 But after eating a few bites of the smooth and tender foie gras, I felt the initial waves of slipping into the inevitable PDC high-caloric haze. The exceedingly rich and buttery dish was a bit overwhelming for this non-lumberjack. Luckily, I had ordered an elegant Beaujolais to accompany the meal. The unfiltered, unsulfured and wild-fermented 2014 Old Vines Fluerie from Domaine Marcel Joubert (made from organically grown Gamay grape) made eating my artery-jamming feast a little easier. After the duck, came yet another extremely rich dish I’d ordered from the daily special menu: a parmentier of foie gras, veal and potatoes served piping hot in a small baking crock. This dish was nothing but unadulterated comfort food. Here, the ever-present foie gras formed a floating layer that melted like cheese above the broth of tender veal strips. It was delicious and its composition reminded me a little of French onion soup. At this point, dessert was simply an impossibility and I was secretly glad that I’d passed on PDC’s bigger and even more decadent menu items (that night there was a steak, a burger, poutine, six kinds of foie gras, stuffed pigs feet, snow crab, pork shanks, ham, meatloaf and a salmon head). 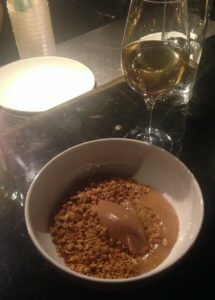 Dinner on my second evening in Montreal was a little off the well-worn track for visitors, but Manitoba sparked my interest with its unusual mission statement: We wanted a taste of the forest in our plates, a taste of nature in our glasses, wood, rock, wind. With its focus on hearty and indigenous Canadian game meats and seafood, root vegetables, seasonal local produce, wild-crafted forest foods, organic and biodynamic wines and artful preparations inspired by the sights, flavors and textures of boreal forest itself, Manitoba did not disappoint. Tucked into a small nondescript brick building on a quiet, nearly deserted block at the industrial edge of Montreal’s hip Mile-Ex/St-Zotique neighborhood, right off the far western end of Avenue du Parc, Manitoba has become a popular dining destination. 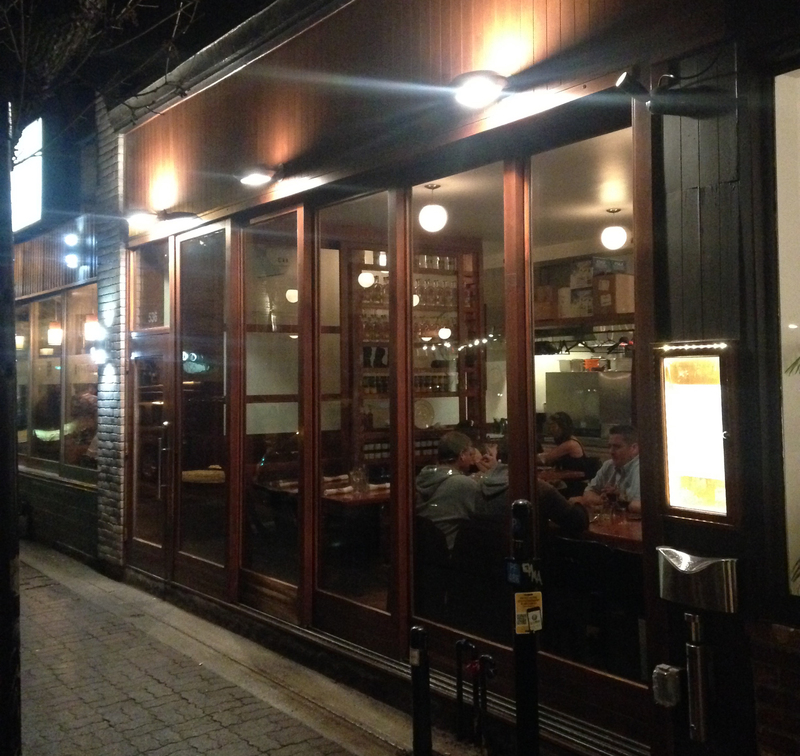 It won Eater Montreal’s best restaurant of 2014 just months after opening. It was easy immediately to see at least part of the reason it’s gotten such buzz: the space is pretty ideal. 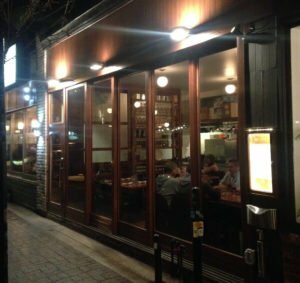 You pass through the restaurant’s door into a hallway-like entry with a low slatted ceiling and recessed lights. Beyond this dark entryway, the restaurant’s tall open main space, with a chic, bare-brick minimalism and focused lighting to create the feeling of privacy in its darkened corners, contrasts with a well-lit open kitchen. And despite the stylish austerity of the décor, Manitoba feels refreshingly welcoming and cozy — something for which the two co-owners, Elisabeth Cardin and Simon Cantin, who also own the local design firm, La Firme, undoubtedly deserve credit. Unlike the bustling PDC, the spacious and relaxed Manitoba is clearly designed as a place for relaxing into an exploratory meal. After again choosing a seat at the bar in front of the kitchen, I was handed a list of alluring cocktails with fun, punny names like the Cold Fashioned and the Spruce Springsteen. I chose to try one called the Alveole — a rum-based lime spritzer sweetened with intriguing “honey with boreal spices.” Rustically garnished with fir needles, rosemary and bee pollen, it was a light and lovely concoction with hints of evergreen and just the right amount of sugar. Another cocktail, the Gin and Jam Sauvage, was a gentle balance of gin, curacao, fresh pepper and tangy sweet elderberry jam (that comes on a spoon ready to be mixed in). Both drinks would make ideal summer refreshments out on the restaurant’s back terrace. Settling in with these delicious beverages, I got to watch the kitchen crew prepare my duo of shellfish appetizers from the menu: a whelk with grilled leek served in a thick, smoked egg yolk cream and topped with celery leaf ash, and a creamy clam dish served under baked turnips with buckwheat and garnished with chervil and sumac seeds. The thick layer of egg yolk cream sprinkled with ash on top of the chunks of whelk was not exactly the most attractive thing to see on a plate but the dish was marvelous. The leek was a bit difficult to chew but it’s sweet and mild spring-oniony flavor was a great contrast to the tender whelk’s subtle brininess. The dusting of ash added a sharp and smoky complexity and a surprising depth of flavor to the dish. The clam dish was equally interesting but in a completely different way. Plated like a miniature rocky, scrub-covered island adrift in a chowder sea, my instant affection for the tasty dish required no thought at all. However, the interplay of the tangy, lemony sumac and the delicate herbal anise notes of the chervil made for a delicious taste experience that took my brain several bites to process. The juicy and tender clams in their light, chowder-like base and the typically one-dimensional turnip benefitted from these surprising and curious flavors that brought to mind the fresh and earthy flavors of wild-crafted forest herbs and roots. I also tried a wild prawn roll from the specials menu, which was also plated with leeks and cream. Served sushi style in a roll, the prawn meat was clearly of a very high quality but after the truly revelatory flavors of the whelk and clam dishes, it was somewhat bland. After the small plate appetizers, it was time for the first of the main course items: the farm-raised Cerf de Boileau venison with mushrooms, potatoes and malt cream, garnished with a sprinkling of wild mushroom powder. First of all, the venison — which comes from a 1000-acre red deer farm in Quebec (the largest in North America), where the deer live what sounds like fairly natural lives — was beautiful to look at. The loin cut was perfectly seared and served steaming from the skillet given my seating in front of the kitchen. The somewhat caramelized sautéed potatoes and mushrooms provided a familiar but unassuming background to the tenderness of the lean, high-quality meat and the sweet buttery-ness of the malted cream melting onto it. But what kicked the already tremendous dish into the stratosphere for me was the potent wild mushroom powder (made, at least in part I was told, with chanterelle and king oyster mushrooms). The flavor is a bit difficult to pin down but the ground-up blend reminded me of something along the lines of brewer’s yeast, with its yin/yang of saltiness and maltiness. 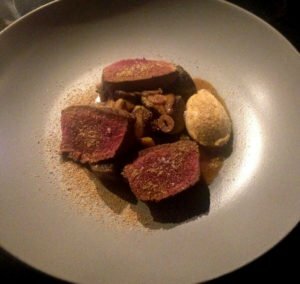 The powder had serious powers of umami and did an amazing job of bringing out the savory gaminess of the venison and balancing it with the other sweeter and creamier elements on the plate. All in all, it was a tremendously satisfying and mouth-watering. Nonetheless, the most interesting part of my culinary adventure in Montreal was yet to come. My anticipation had built steadily all night for the rare chance to taste one of Manitoba’s very unique specials offered that night: seal. Seal is a protected animal in Canada but indigenous groups (who have relied on seals as a primary source of food for thousands of years) are still permitted to hunt them and a very small portion of the meat is allowed to be sold commercially during the hunting season. According to the chef I spoke to, Manitoba was only one of five restaurants in the entire city that got any of this meat. And from the looks of the filet they cut from, they didn’t have much. Like foie gras, the eating of seal meat has many detractors. But given that this particular meat came from an Inuit hunter during the controlled seal-hunt season rather than from the larger and more controversial commercial seal harvest, I felt extremely lucky to try this rare and unique treat. 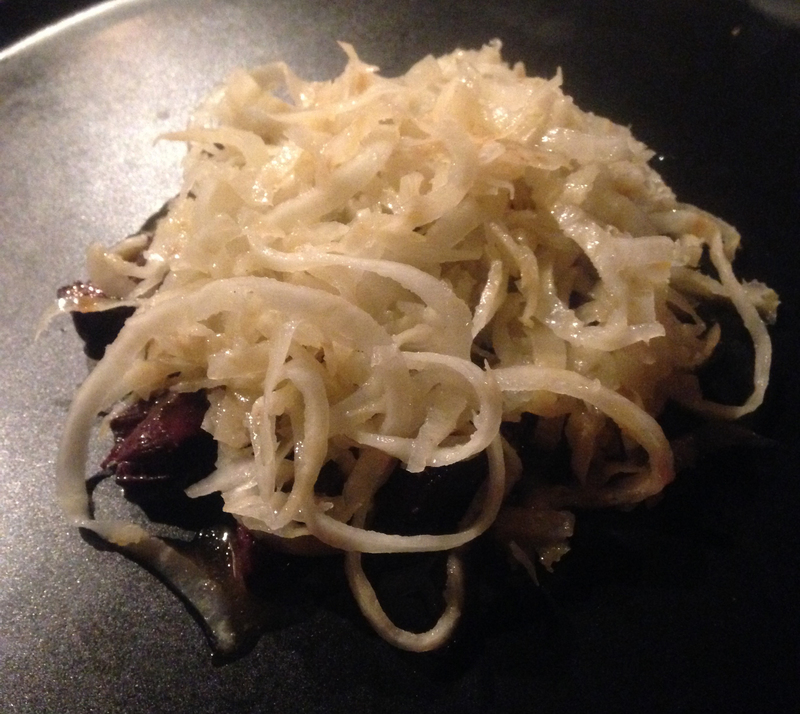 Served under a bed of julienned celery root, the morsels of dark, almost black, seal meal appeared to peek out as if emerging from an under-iceberg swim. The vitamin-rich meat has slightly gamey, organ-like flavors of iron and a hint of brine. It’s also remarkably soft, with no distinct or tough muscle fibers or fat. It’s was actually nearly as smooth as PDC’s duck in the can. One of the more interesting aspects of the meat is that it feels a little oily but is actually extremely lean due to the fact that seals store almost all their fat along their skin, separate from their muscles as a means of keeping warm in the cold northern oceans. Manitoba’s straightforward preparation of the meat without any added flavors (the celery root only added a clean crunch to the dish) spotlighted its qualities and slightly smoky flavor. Dessert to complete this perfect meal was a silky chocolate and balsam fir ganache, served with an apple and caramel sauce and bits of granola. The creamy fir-needle-infused ganache turned out to be the ideal pairing for the tangy fall flavors of the apple and granola. 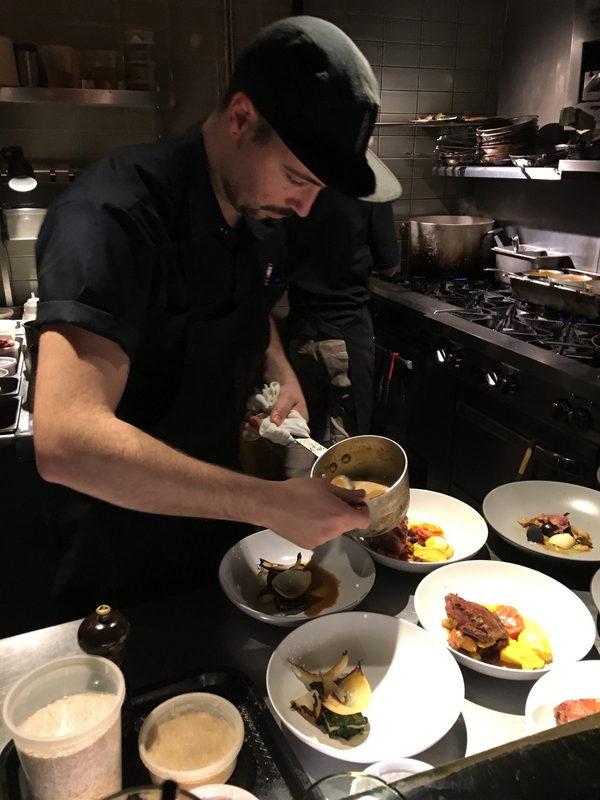 While very different in terms of atmosphere and presentation, both Manitoba and Au Pied de Cochon are great examples of how inventive chefs can use local meats and produce to make an array of flavorful dishes you’d be hard-pressed to find anywhere else in the world.